Jan Knutson is a remarkable guitarist. Listen to his sensitive phrasing on “Sophisticated Lady” or “Beautiful Love.” The melancholy and longing of the lyrics pour out in his notes – they say he knows intimately the mystery of love and what it means to lose it. They say he’s experienced these powerful emotions many times. He’s 17 years old. Really. That makes Jan Knutson a remarkable musician. Sure, music’s been part of his life since childhood: his father is a trombonist in the U.S. Navy Band and his parents had him taking piano lessons at 5, followed by violin lessons. But when he picked up the guitar at the ripe old age of 10, he realized “music’s fun!” He was into Van Halen, Queen, Rush and Led Zeppelin. He started taking lessons from a musicology major at the University of Maryland who was into Django Reinhardt. Jan started taking jazz seriously. He was around 12. Then two virtuoso guitarists entered his life: Paul Wingo and Frank Vignola. 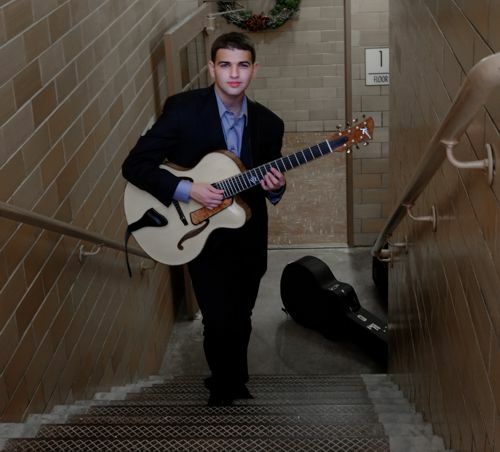 Jan visited Paul at home for lessons and studied online with Vignola, who says, “Jan’s playing just blows me away.” So much so that he suggested Jan make a record, which Vignola produced: Jan’s 2014 solo debut, “Out of Nowhere,” on which the young musician plays a guitar his father built. He’s got some backup on his sophomore release – some of the D.C. area’s finest string players. Tommy Cecil is simply one of the best bassists anywhere – he’s collaborated with all of the area’s top musicians from Charlie Byrd to Shirley Horn and beyond, playing with the likes of Mose Allison and Joe Henderson, among others. Mandolinist Danny Knicely is steeped in the old-time music traditions of Virginia’s Shenandoah Valley and he’s played with the likes of Sarah Jarosz and Tony Trischka. Danny’s also a killer jazz player. And guitarist Steve Abshire is simply a D.C. music legend – guitarists far and wide know his name and he’s played with many of them, not to mention working with such world-renowned vocalists as Joe Williams, Rosemary Clooney and Etta Jones. He’s also Jan’s current teacher.